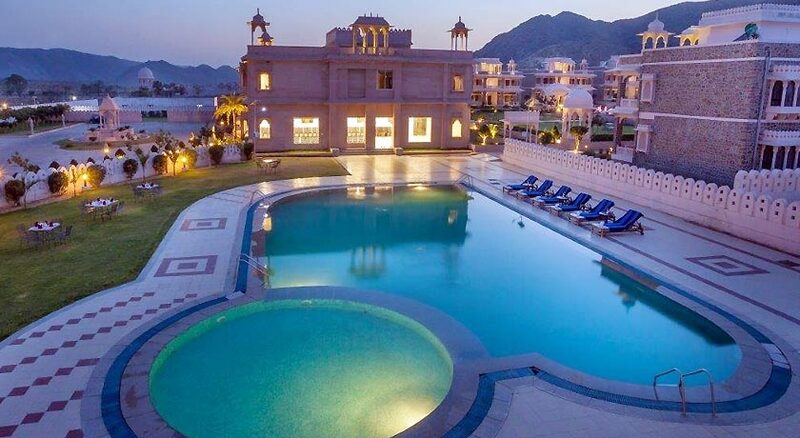 Bhanwar Singh Palace Hotel Pushkar is a projected five-star independent spa resort in Pushkar. 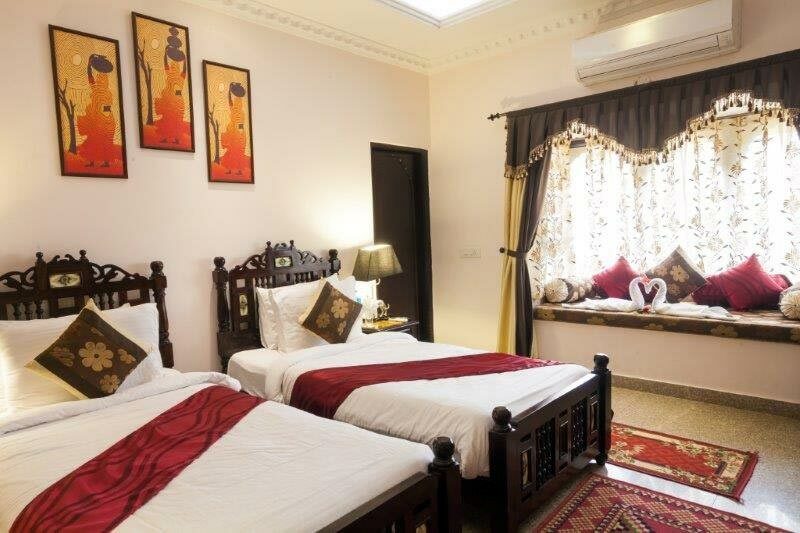 The hotel is situated away from the cacophony of the city but at the same time the entire city’s attractions are easily accessible from the hotel. 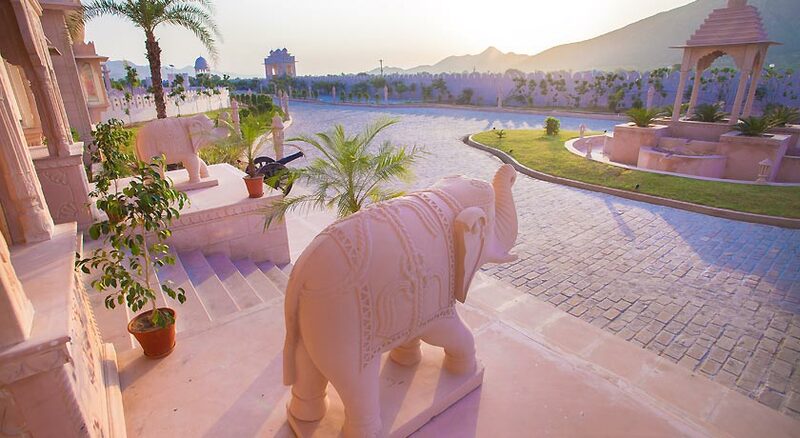 The hotel also has a beautiful garden and from all the rooms you can have a wonderful view of the Aravalli Mountains. 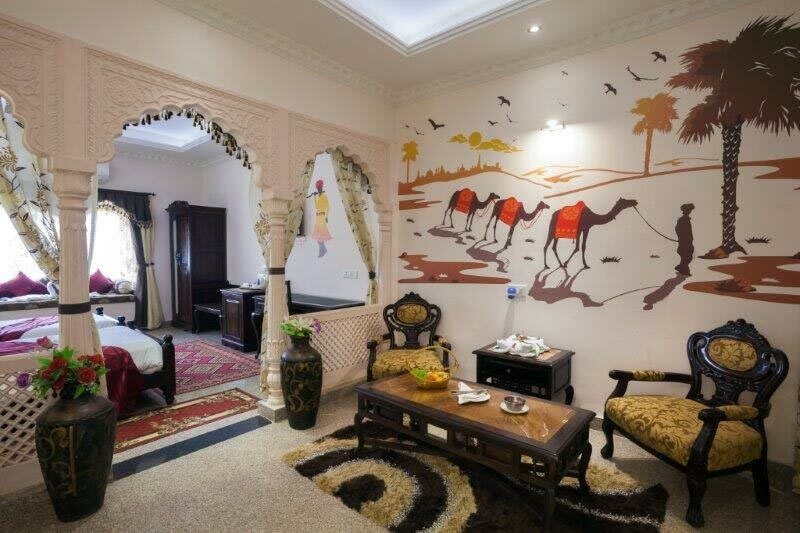 The hotel is based on the architecture of Merwara region of Rajasthan and has rooms that to the centre lawn which is the unique feature of the Bhanwar Singh Palace Hotel. For the guests, it offers four types of accommodation namely Royal villa rooms, Royal rooms, Maharaja Suites and Maharani Suites. To serve the customer, the hotel has a multi cuisine restaurant and a bar to relax. 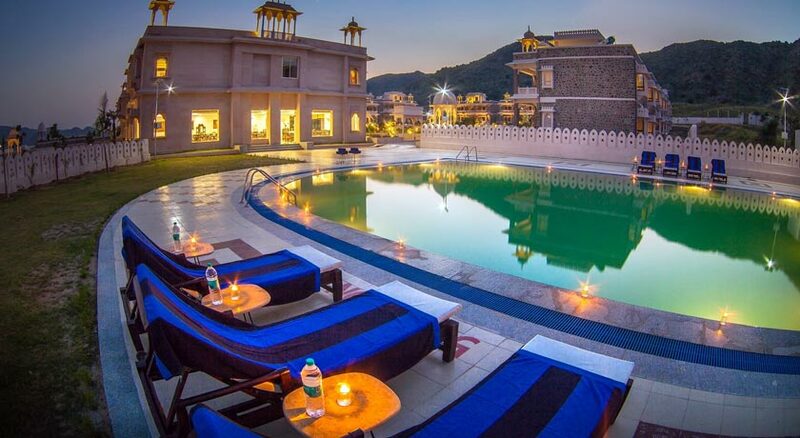 The hotel has a swimming pool and spa for the guests to relax. It has got conference rooms to meet the needs of the business clients. 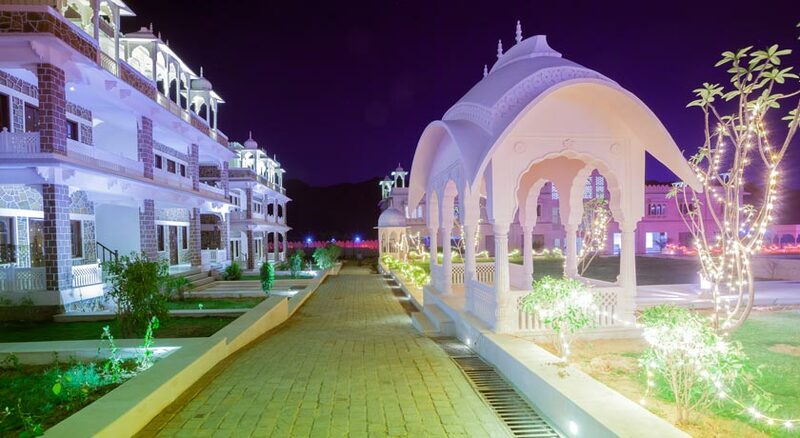 It has a centre lawn to hold private parties and a grand function lawn to organize wedding and other grand functions. 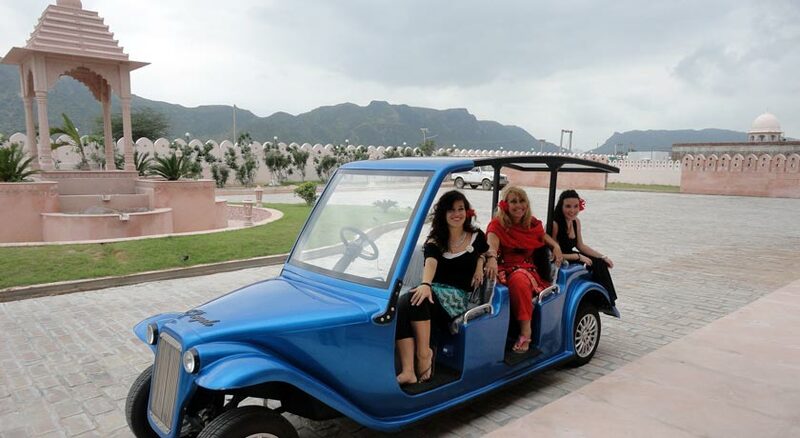 The hotel also arranges for camel safari, jeep safari and horse riding and it also arranges for sightseeing trips in and around Pushkar. Thus, it is ideal for both business as well as leisure traveler. 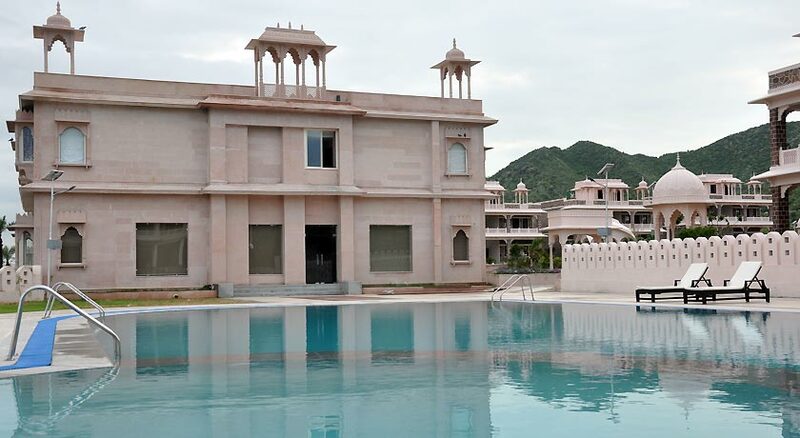 These are 308 sq ft modern and luxurious rooms that also offer a good view of Aravalli Mountain as well as gardens. These are ideal for those who want to have a lavish accommodation. 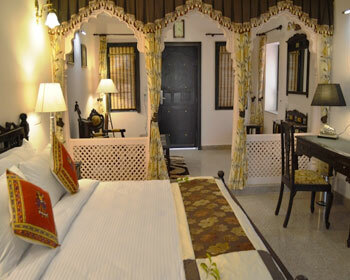 The rooms also come with amenities like attached bathroom with shower cubicles, 24 hours hot/cold water, 24 hrs room service, housekeeping, laundry/dry cleaning, in room electronic safe, personal bar, LCD TV with cable/satellite television, DVD player on request, Telephone with STD/ISD, Wi Fi, Internet, hair dryer, bathroom amenities, toiletries, doctor on call and parking. The 743 sq ft room on the first floor with lawn also offers wonderful view of the garden as well as the mountain. 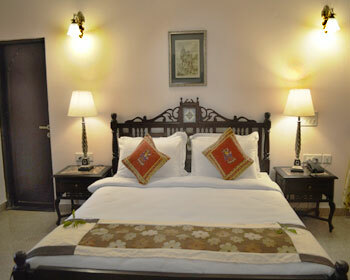 The elegant and well furnished rooms are ideal to stay with your family. 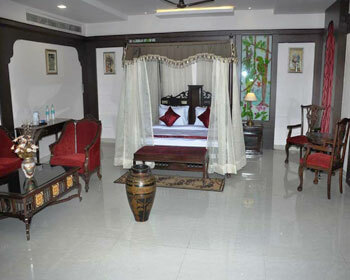 The rooms are also provided with amenities like plush beds, wardrobe, 24 hours hot/cold water, attached bathroom with shower cubicles, housekeeping, 24 hrs room service, in room electronic safe, laundry/dry cleaning, LCD TV with cable/satellite television, personal bar, Telephone with STD/ISD, DVD player on request, Internet, Wi Fi, bathroom amenities, hair dryer, doctor on call, parking, toiletries, etc. The 700 sq ft luxurious and spacious suites also come with private sitting area as well as a small lawn. These are ideal for those who are looking for a home like setting. The amenities that come with these rooms are wardrobe, plush beds, attached bathroom with shower cubicles, 24 hours hot/cold water, 24 hrs room service, housekeeping, laundry/dry cleaning, in room electronic safe, personal bar, LCD TV with cable/satellite television, DVD player on request, Telephone with STD/ISD, Internet, hair dryer, bathroom amenities, toiletries, parking, doctor on call, Wi Fi, etc. They also have outdoor space for barbeque. 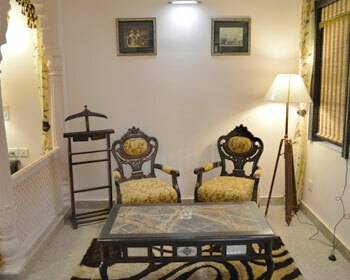 These suites are also 700 sq ft and situated on ground floor and come with private sitting area as well as small lawn just like the Maharaja Suite. There is also space for outdoor barbeque and these suites are ideal for bridal suite either for honeymoon or for first night. The suites come with amenities like attached bathroom with shower cubicles, plush beds, 24 hrs room service, 24 hours hot/cold water, housekeeping, wardrobe, in room electronic safe, laundry/dry cleaning, LCD TV with cable/satellite television, personal bar, Telephone with STD/ISD, DVD player on request, hair dryer, Internet, toiletries, parking, Wi Fi, doctor on call, bathroom amenities, etc. The 24-hr delectable multi-cuisine restaurant serves scrumptious Indian, Chinese, Eastern and continental cuisines. Also don’t forget to taste on the local delicacies. You can either dine in the all-day dining restaurant or at the open restaurant near the pool side. 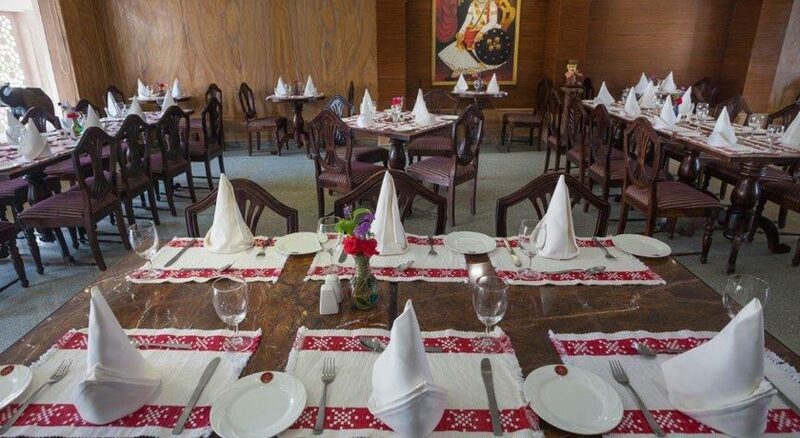 You will be served with sumptuous food which you can enjoy in the open air. The interiors of the all-day dining restaurant are warm and cosy and is quite inviting. Be prepared to taste some exotic delicacies experimented by our chef. This is one of the best bars in Pushkar. In this exclusive bar you can either have pre-dinner cocktails or a late night drink. This is also a perfect place to unwind at the end of the day and also to have business meetings over a drink of your choice. The bar is well stocked with national and international alcohols and spirits. Some of the alcohols and spirits served are cocktails, champagnes, cognac and alcohols and non-alcoholic drinks.